Home » Posts tagged "The Garden"
1. 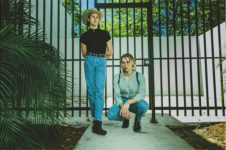 The Garden is a two person band, made up of identical twins Wyatt and Fletcher Shears of Orange County, California. 2. California Here We Go is their most recent single and was the first video of theirs that I watched. My first response was whaaaaat followed by watching a whole bunch of videos by other people and then going back to watching The Garden again because they were by far the most unusual and interesting. Also I was trying to figure out why they were wearing clown make-up. I still don’t know, though it is a recurring theme in their recent videos. The Garden – "California Here We Go"
3. The Garden are very much a law unto themselves. Their universe is unique and partially closed; their genre – “vada vada” – is their own invention and more symbolic than descriptive. Even with the sound on and the lyrics mostly intelligible their videos are an experience akin to watching surrealist art movies in a noisy bar.